​t feels as if a pairing of Jane Austen and Whit Stillman was inevitable. Both are wry social critics who specialize in careful observations of middle-to-upper-class life: Austen’s fiction dissects the snobbery of the Georgian era; Stillman’s comic films gently skewer the idealism of the budding American bourgeoisie. In Metropolitan, Barcelona, and The Last Days of Disco, the director genially undercuts the pomp and pretense of those exercising late 20th century privilege. His interest in our craving for attention, affirmation, status, and appearance dovetails well with Austen’s satiric dismemberment of a genteel but pitiless pecking-order. With his new film Love & Friendship, the director has blended his modern sensibility with the storyline of a little known and unpublished early Austen novel. Kate Beckinsale is impressive as Lady Susan Vernon, a young widow who visits the estate of her in-laws to wait out festering rumors about her alleged affairs. The stunning woman dazzles with her beauty and manipulates everyone around her with effortless charm and biting wit. Beckinsale played Emma in the BBC’s 1996 adaptation of that Austen novel and played the role of Charlotte in Stillman’s 1998 film The Last Days of Disco. So it should be no surprise that the actress, who also appears in huge Hollywood productions, can handle the verbal acrobatics of this Stillman/Austen hybrid with aplomb. Lady Susan’s ulterior motive is to secure a husband for herself and a future suitor for her reluctant daughter, Frederica. Of course, problems multiply: Lady Susan complicates matters when she attracts the attentions of the debonair, but insecure, Reginald DeCourcy (Xavier Samuel), the rich and profoundly silly Sir James Martin (Tom Bennett in a brilliant and sparkling comic performance), and the handsome, but married, Lord Manwaring (Lochlann O’Mearáin). She also manages to inspire considerable consternation in the owners of the estate, Lady DeCourcy (Jemma Redgrave) and Sir Reginald DeCourcy (James Fleet), while driving Lord Manwaring’s wife, Lady Lucy (Jenn Murray), to a state of absolute hysteria. Lady Susan’s best friend is Alicia Johnson, reinvented by Stillman as an American ex-patriot from Connecticut. The character is played by Chloë Sevigny, who was also featured with Beckinsale in The Last Days of Disco. Johnson the a ward of Mr. Johnson (Stephen Fry). 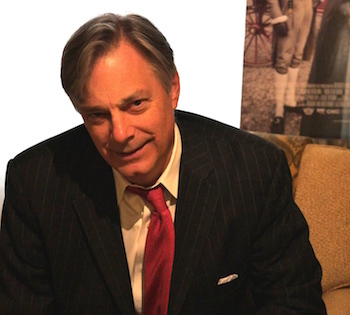 Director/author Whit Stillman. Photo: Tim Jackson. The film’s source is an epistolary novel, a tale told through a succession of letters. Originally titled Deceived in Freindship [sic], Austen wrote it between the ages of 13 and 18 as an amusement for her family. Stillman has rethought the novel, under the title Love & Friendship: In Which Jane Austen’s Lady Susan Vernon Is Entirely Vindicated. His rewrite redeems Lady Susan, who comes off rather wicked in the Austen narrative. The narrator of the Stillman novel is Rufus Martin-Colonna de Cesari-Rocca, the son of Juliana, the sister of the buffoonish Sir James who, by way of marriage, is partial toward defending Lady Susan. Stillman’s novel has the virtue of incorporating some of the best lines of dialogue from his film. Though not as intricate as Austen’s original, Sillman’s redo helps clarify Austen’s characters and their motivations while adding useful, albeit humorously prejudiced, commentary. Both book and film start with a list of Principle Personages. The volume’s Genealogical Table is also helpful. The original Austen letters are published in the new version’s Appendix. Stillman, writing as Rufus Martin-Colonna de Cesari-Rocca, comments on these missives, penned by a women he refers to as “the spinster authoress.” The ‘author’ (Stillman writing as Cesari-Rocca) then accuses Austen of acting like ‘a counterfeiter’ and altering the letters to put Lady Susan in a bad light. Cesar-Rocca also defends the goofy Sir James Martin (who is a relative): “The spinster authoress describes Sir James as punctuating each phrase with a laugh; this is a common low tactic of disparagement.” Near the end of the yarn the reader will discover that Cesari-Rocca is dealing with some questionable circumstances himself (“the entire controversy regarding my financial and legal matters”). It feels as if a pairing of Jane Austen and Whit Stillman was inevitable. Both are wry social critics who specialize in careful observations of middle-to-upper-class life: Austen’s fiction dissects the snobbery of the Georgian era; Stillman’s comic films gently skewer the idealism of the budding American bourgeoisie. In Metropolitan, Barcelona, and The Last Days of Disco, the director genially undercuts the pomp and pretense of those exercising late 20th century privilege. His interest in our craving for attention, affirmation, status, and appearance dovetails well with Austen’s satiric dismemberment of a genteel but pitiless pecking-order. With his new film Love & Friendship, the director has blended his modern sensibility with the storyline of a little known and unpublished early Austen novel.